Thousands of passengers are facing long delays after airports in Scotland and Ireland closed because of a fresh cloud of volcanic ash from Iceland. Flights will remain grounded until 0100 BST on Thursday at Glasgow and 0700 BST at Belfast, however Edinburgh re-opened at 1900 BST on Wednesday. The Civil Aviation Authority (CAA) advised passengers to check with airports before travelling. Last month, ash clouds from the same volcano grounded flights for six days. Air traffic control body Nats said all airfields in Northern Ireland plus Islay, Campbeltown, Ronaldsway, Lands End and the Isles of Scilly would be in the no-fly zone from 0100 BST until 0700 BST on Thursday. All other UK airfields would be outside the no-fly zone during this period, it added. 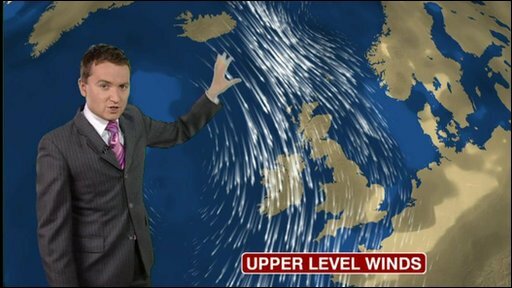 A Nats statement said: "Latest Met Office information suggests the cloud will move west overnight. "Based on this information, we expect most of the airfields to become available again from 0700. 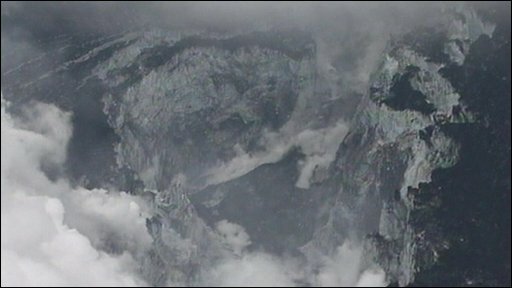 "However, we would caution that the ash cloud is dynamic and continues to change shape and the situation may change again." Nats will issue a further update at about 0330 BST. In Scotland, Aberdeen airport has flights arriving and departing as normal, and business resumed at Inverness at 1300 BST. Edinburgh Airport reopened at 1900 BST with the first flights leaving just minutes later. Passengers due to fly from the Scottish airport were warned there would still be some disruption through the evening and on Thursday. The Irish Aviation Authority (IAA) said airports in the Republic of Ireland would start to reopen from 0400 BST on Thursday. The IAA said: "The current ash cloud is moving south westwards and airport restrictions will be lifted according to its progress." Ryanair has cancelled all flights to and from Belfast, Derry, Edinburgh and Prestwick airports. But the no-frills airline said it expected all its UK flights to operate on Thursday, although there would be continued disruption in Ireland. 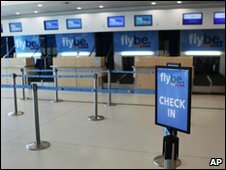 Flybe has cancelled all flights to and from George Best Belfast City, Glasgow and the Isle of Man. EasyJet flights to and from George Best Belfast City, Belfast International and Glasgow have been cancelled. There were scenes of confusion at many of the affected airports with airspaces opening and closing at different times throughout the day. It was the second day of disruption for Northern Ireland and the Republic, with some passengers failing to show up at Belfast's airports even though they were open on Wednesday morning. 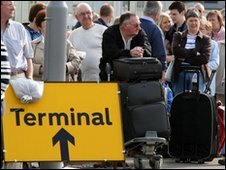 About 200 flights take off daily from Glasgow Airport but only 13 departed on Wednesday. Some passengers were taken by bus from the airport to catch flights from other airports. One of those hit by the disruption was Mabel McGeachie, 62, from East Kilbride, who had been due to fly from Glasgow to Malaga. She was travelling to Spain with 10 friends and relatives for her daughter's hen night and was told the next available flight was on Sunday - the day she was meant to return. "We are feeling disappointed as we were looking forward to it and I don't think we'll be able to rearrange it," she said. Earlier on Wednesday, there were fears the high concentrations of ash could close airspace in north-west England but the area remains outside the no-fly zone. The CAA said airports in south-east England were unlikely to be affected. CAA chief executive Andrew Haines said ash would probably "continue to disrupt UK air travel for the foreseeable future". "Scientists are tracking the cloud's movements constantly but its location changes frequently, depending on the strength of eruptions and prevailing winds," he said. "When the ash level exceeds that agreed as safe by the industry we have to restrict flights accordingly. "This decision is not taken lightly and we appreciate the huge inconvenience and disruption this causes to the many people and businesses affected." BBC meteorologist Matt Taylor said the situation was likely to improve on Thursday. "For the rest of today the largest concentrations of ash will remain over parts of western Scotland and Ireland," he said. "However, through tomorrow as winds go more north-easterly the ash cloud is expected to be pushed out over the Atlantic and clear of the UK." Ian Hall, director of air traffic control body Nats, said they were keeping the situation under review. "There are glimmers of optimism and hope, but we've been there before," he said. "The volcano is still erupting, the wind is still blowing from the wrong direction as far as our airspace is concerned, and so long as it does that we'll have to stay on our toes." Some flights to and from Dublin Airport on Thursday have already been cancelled. On Tuesday, flights in and out of the Irish Republic, Northern Ireland and Scotland's Hebrides were suspended at the first sign of an increase in volcanic ash levels. Flights over Europe were banned last month because of fears the volcanic ash could damage plane engines. The meeting came after criticism from the airline industry that governments took an over-cautious approach to April's ash cloud crisis and grounded flights unnecessarily.